If you are teaching kids art, this is one you’ve got to try! 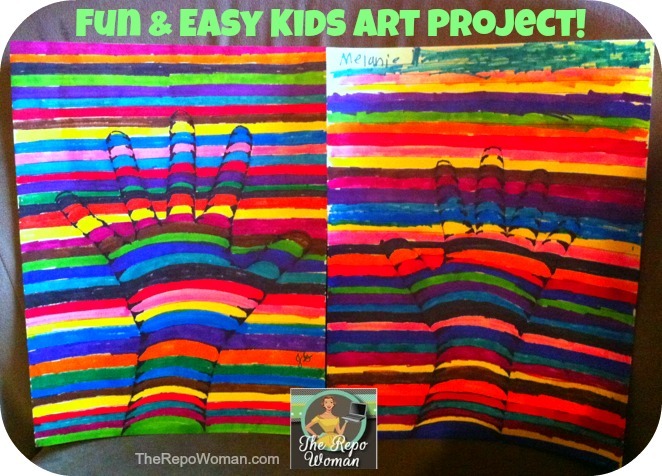 It’s a simple and fun Art Project Idea for the kiddos! My kids and I always have tons of fun when we bust out he art supplies! Give this fun and easy 3D hand tutorial a try! Trace your hand. The kids may need help with this part. Connect the lines inside the hand but make these lines curved. This will help with the 3D look! Finally, use a black marker to outline your project completely. Look at step 4 in the photo below: make sure to add little triangles at the base of each connecting line of your hand. This will give a shadow and help with the 3D look too! Note: The steps in these photos are not completed. Complete all of your lines before going to the next step. Color it last! Once it’s complete, hang it on the refrigerator and step away from your art work to see your masterpiece! Voila! You just created a 3D hand!!! Your kids will be so proud! Even the neighbor kids got a kick out of this project!!! The photo above is my project along with my daughters project (age 7). Here’s the best part, it takes about an hour to complete depending on how fast they work. 1 hour of pure quality entertainment, PRICELESS!